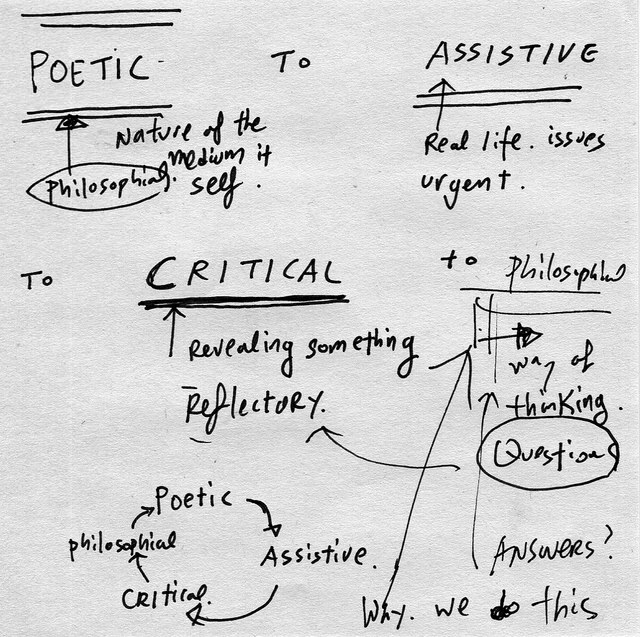 the school for poetic computation: assistive tech, fall 2014 | Abler. Experiments with computation are restricted by marketing demands, by defense support, by the pressures of grant funding. AT&T killed Bell Labs one laid-off researcher at a time. What is the new Bell Labs? Where are the spaces for open-ended creative computational experiments? There is very little support now for creating what one imagines. There never was much, but now there is less. You have to clear the space yourself. Paint the car at night for no good reason. Create an open community biolab. Start a school. Ignore everyone’s expectations but your own. Oh joy! My people! And this fall, they’re taking on assistive tech as one of the lines of their research. As you might have seen in the way I ran Investigating Normal at RISD last year, I love imagining this open-endedness being nourished in the research space of adaptation and prosthetics. I’ve been asked to join the gang in some capacity; more news on that if it all comes together. People want to know how the school is going. Friends, professors, my partner’s parents. The thing is, I’m not even sure what the school is. One of the students says it’s an art installation. I hope he means that in a good way. There have been workshops on 3D printing, color, circuits, math, Node.js, Python, openFrameworks, storytelling, Raspberry Pi, Arduino. Readings: Deleuze. Alexander Galloway. Kate Crawford. Jan Zwicky. Et cetera. Questions: How can we measure time with space? How can we get the machines to see each other? How do I make the world more loving? How do I know the machine understands me? Discussions: What the hell is poetic computation, anyway? Are we being poetic enough? How do we decide what to make? What is the final show? Should we schedule workshops or should we schedule making? Should we find solitude or stick with the group? The theme recurs: now that we’ve cleared the space, how do we fill it? A typeface designer and a creative technologist turned a red LED into an occupied light for the bathroom. Someone wants to make grass scream when it’s stepped on. Someone is feeding weather through a music box. You can sign up for this big ride at the School’s web site. I can’t wait to see the work that results. Image: One of Taeyoon Choi‘s many enigmatic thinking-drawings, from SFPC’s web site.